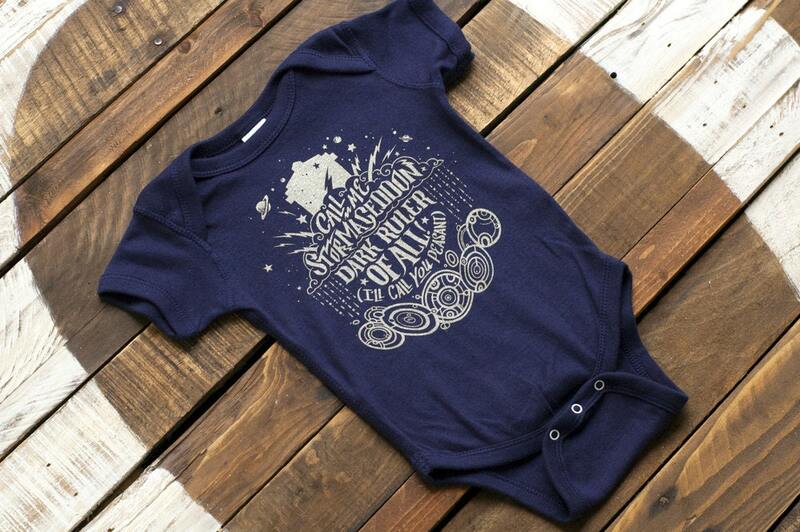 Our Doctor Who baby bodysuits and toddler shirts are the perfect gift for little Whovians. 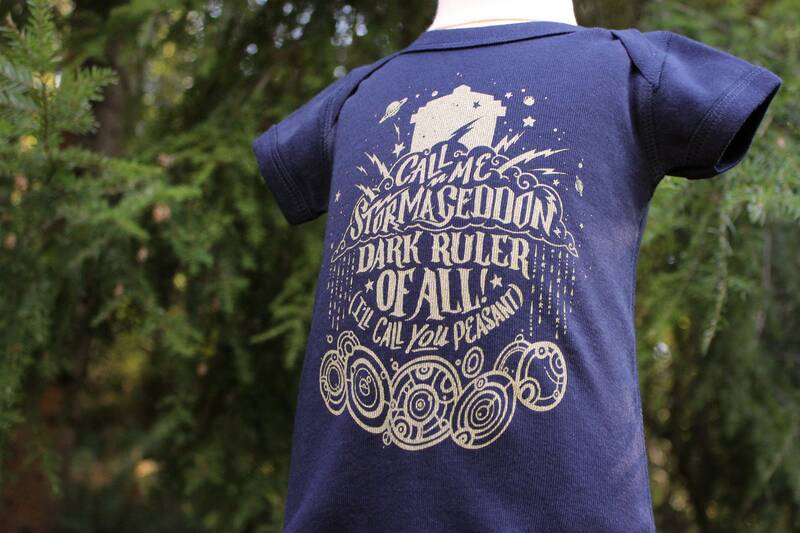 Featuring our original "Call Me Stormaggedon" artwork with the TARDIS and Gallifreyan, these bodysuits and tees make wonderful gender neutral baby shower gifts. 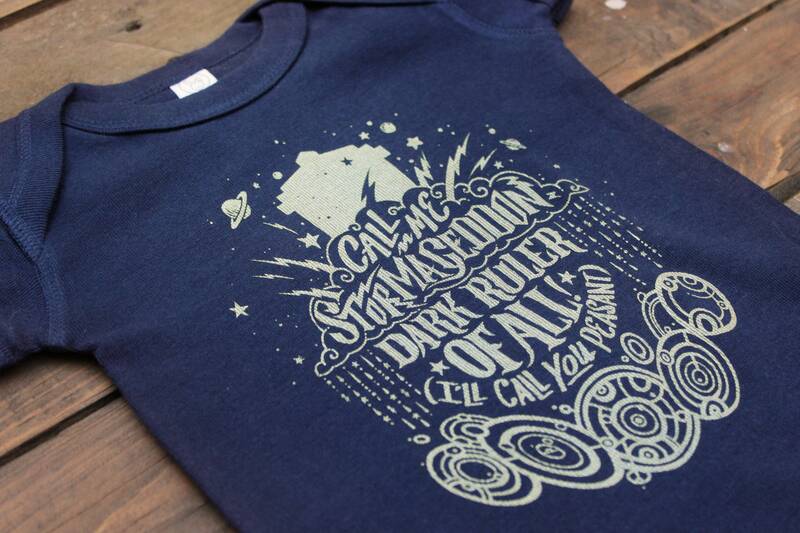 These bodysuits and tees are navy blue with shimmering golden ink. 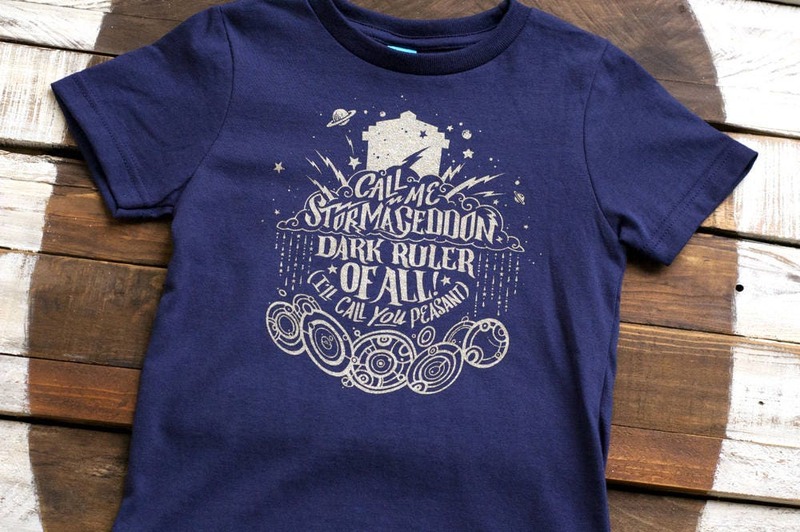 Available in sizes 6 months to Children's 5/6. Every Unicorn Empire shirt is printed with care by our team right here in Washington State. We print with high quality, water-based inks and use traditional hand screen printing techniques, making our shirts uniquely soft and durable. 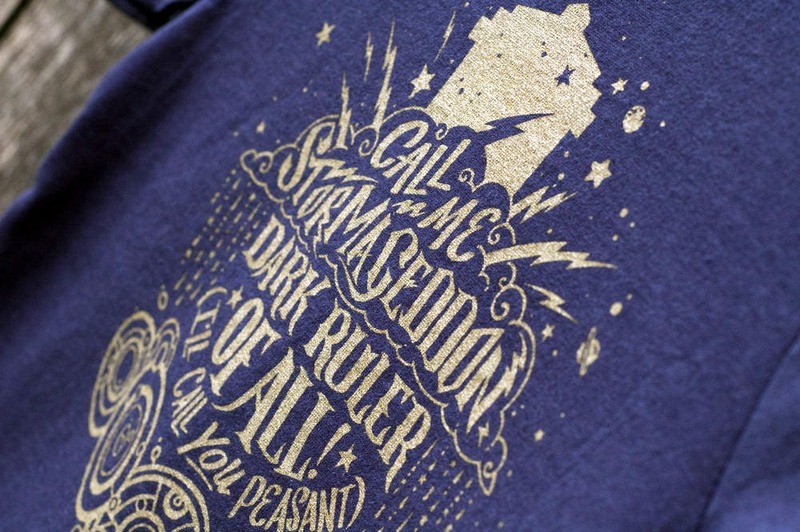 The beautiful golden ink is a glittering iridescent light gold that will shimmer in the sun. The bodysuits and shirts are 100% cotton for softness and durability. Because the ink is water-based, these shirts and bodysuits are durable enough to be machine washed many times. 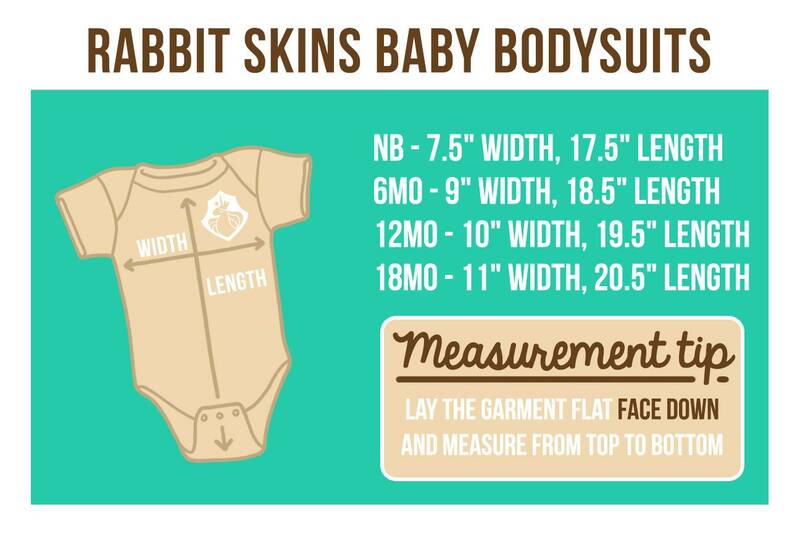 Sizing: Rabbit Skins bodysuits are sized in Newborn, 6 Month, 9 Month, and 12 Month sizes. Newborn corresponds to "0-3 Months" on the drop-down menu, 6 Months to "6 - 9 Months", etc. 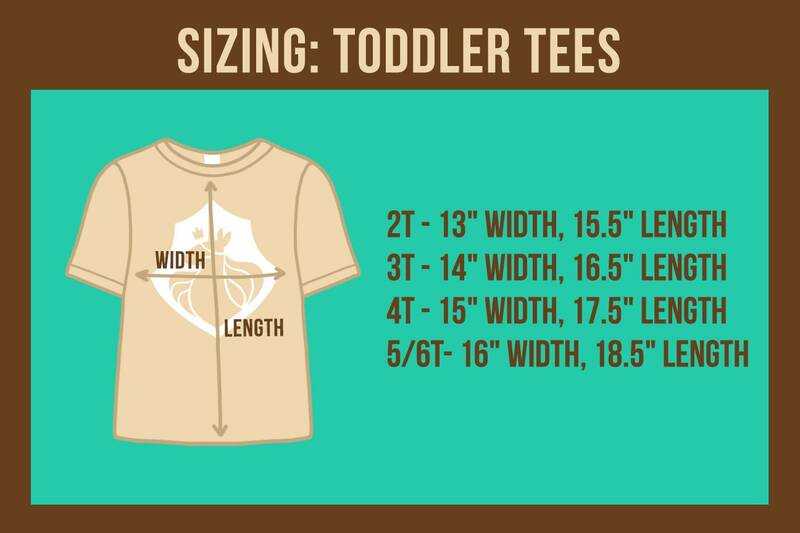 A size chart is available in the listing photos if you would like to compare the brand sizes to an item you already have. If your little one isn't here yet or if you are buying a gift, we recommend choosing 6 or 12 months as sometimes babies grow faster than you expect and new parents are often gifted many newborn clothes but fewer larger sizes. When we heard that our friends were expecting their own little Time Lady, we knew we had to do something special for her. 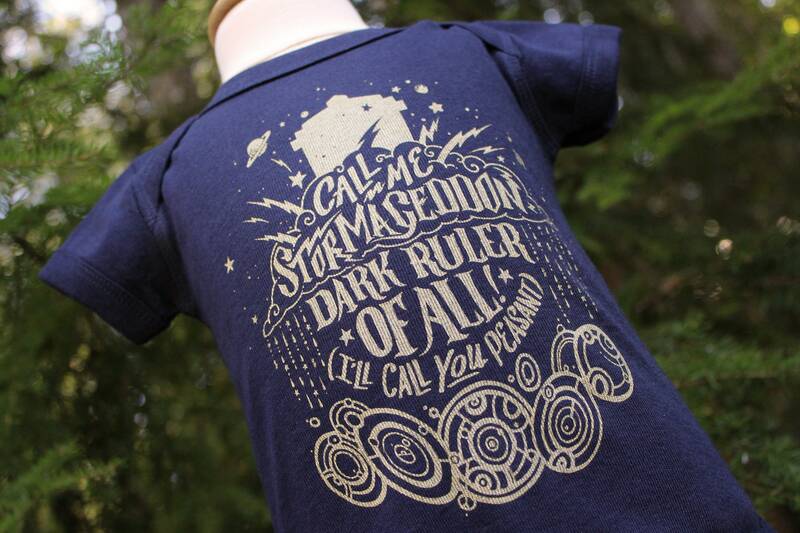 This unique baby and toddler shirt was designed with little Time Lords and Time Ladies in mind. To keep things gender neutral, I edited the original quote from "dark lord" to "dark ruler", but the sentiment is the same. Great quality, and just as described! I wish the quote was accurate to the show, but that’s on me... should have read it closer before buying. 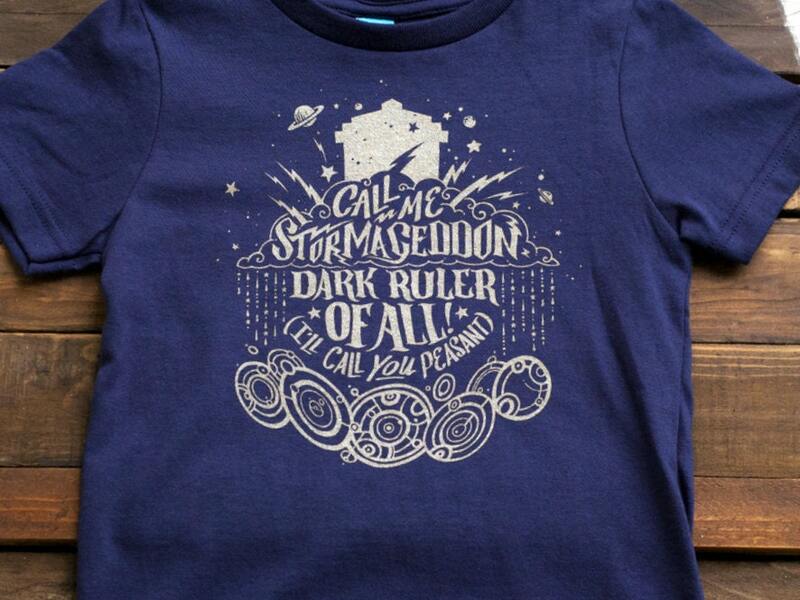 Still, an awesome shirt for my budding Whovian! Love this little onesie. 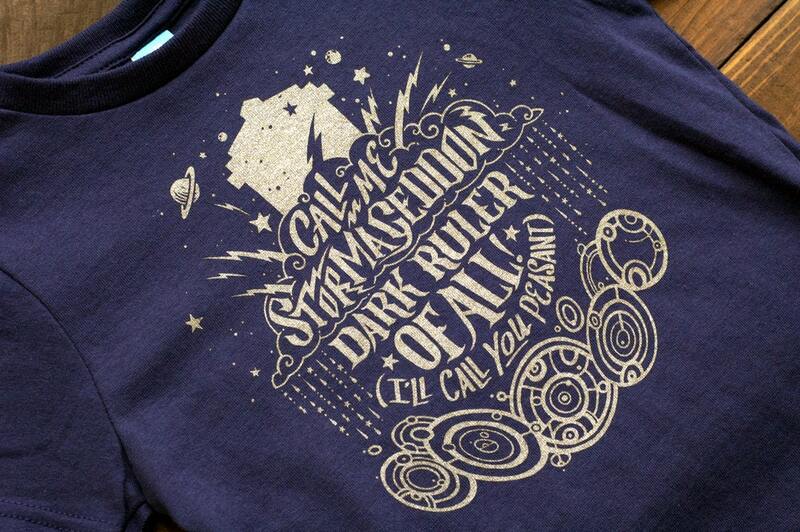 Bought it for my friend who is due in April and gave it to her at a Doctor Who con. She loves it!